In this article I want to share some of my thoughts on my understanding of Sōke’s vision. It will seem quite esoteric to most of you. Please forgive me. On Sunday, at the end of the class, Sensei gave a little speech. Amongst many subjects, he announced the theme for 2016. Without surprise the theme is “42”. Sensei explained that the Taikai commemorating Takamatsu sensei’s passing anniversary that will take place on the 2nd of April 2016 will be the beginning of a new cycle of 42 years. Takamatsu sensei died on the 2nd of April 1972. The 2nd of April 1973 was the first year of the 42-year cycle that ended this year, in 2015. Sensei said that it took him 42 years to master what he had received from his beloved teacher. He added, half joking, that, for a long time, he understood nothing (that gives hope to many of us). Now, is the time for a new beginning. The new Honbu inaugurated on the 22nd of February of 2015 was the end of the previous cycle. When the new dōjō opened, Sensei told us that it symbolized the beginning of a new era for the Bujinkan. The following is how I understand the logic of the 42-year cycles. Last year, I wrote that the date of the inauguration of the new Honbu, might not be accidental but chosen on purpose. 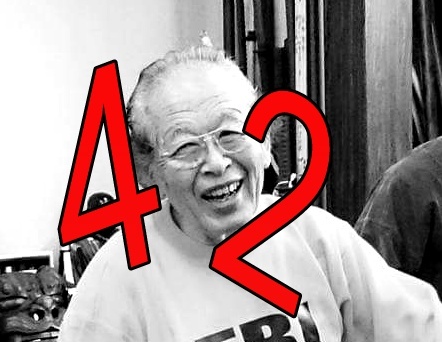 As you know, Hatsumi Sensei and the Japanese love numerology. And Sensei is definitely very Japanese in this respect, and love to play with numbers, symbols and spirituality. So we have two dates: the opening of the new Honbu on February 22nd, 2015; and the Taikai on April 2nd, 2016. Both can be translated with “69”. In numerology, the 22nd of February (02) is 6; and 2015, the 27th year of Heisei is 2+7 or 9. This is “69”, or Roppō Kuji (2), which is another representation of Inyō (yin-yang). (3) You might have noticed that the concept of Inyō is deeply rooted into the Bujinkan system. The old cycle of 42 years that ended in 2015 (based on the Heisei calendar), is reborn in the modern times, next April 2016 (based on the Gregorian calendar). The previous 42-year cycle was the one of Takamatsu Sensei; the new cycle will be the one of Hatsumi Sensei. And it will be our duty to carry on his teachings, the way he did with the ones he received from Takamatsu Sensei. This way of understanding reality, might look weird to us westerners, but knowing Sensei, I would not be surprised that this is the kind of thought process, he went through to come up with this new theme. The new 42-year cycle that will begin in 2016, is another Roppō Kuji (69 or yin-yang). Symbolically, the old world gives way to the new world. For me, it is his way to tell us that, starting next year, he is going to leave the future of the Bujinkan to us. He is doing what Takamatsu did for him in 1971 when he inherited the nine schools. 1. The answer “42” that became famous with the book “the Hitchhiker’s guide to the Galaxy” is one amongst many. You don’t need mice. Check this article to know more: https://kumafr.wordpress.com/2013/08/04/42-the-end-of-the-cycle/ . 3. 陰陽/inyō/cosmic dual forces; yin yang; sun moon, etc. 4. This is also “69” because 2nd of April (04) is 2+4 = 6; and 2016 is 2+1+6 = 9. 5. Maru no ichi was the name of Takamatsu sensei’s restaurant in Kobe. This is also another name for Inyō. Previous Post Half A Million Views!